Local news service Al Sumaria claimed that “11 civilians from one family” died after coalition airstrikes hit the village of al Qayyarah south of Mosul on the morning of August 24th. Local reports mentioned Al Shuhadaa neighbourhood ( حي الشهداء ) in the town of ( القيارة ) Qayyarah, southern Nineveh. The coordinates for ( القيارة ) Qayyarah are: 35.7977836, 43.2935143 We were unable to locate Al Shuhadaa neighbourhood ( حي الشهداء ) on maps. 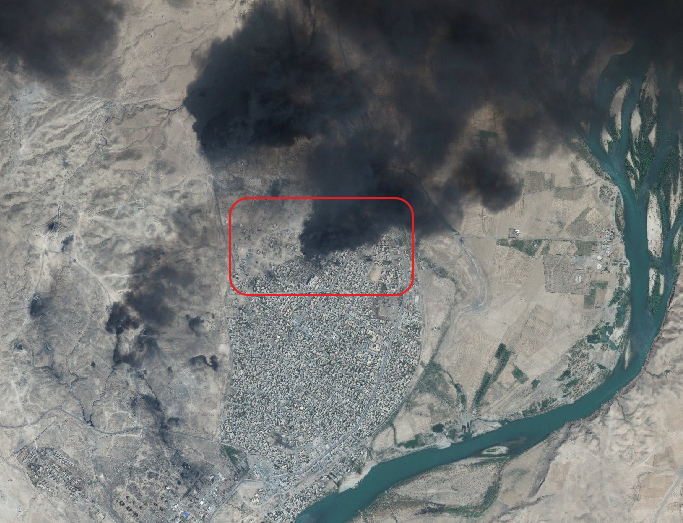 However we suspect the neighbourhood is located in North Qayyarah ( القيارة ) as the news outlet rudaw.net, reported that people from this neighbourhood complained about oil fires between August to September 2016. The oil fires are clearly visible in available satellite imagery from time period, potentially identifying the neighbourhood. Fires in 2016 potentially mark the location of Al Shuhadaa neighbourhood ( حي الشهداء ), which is not marked on any maps.